The abovementioned line is actually what you call the Miranda Right. In general, this right entails you your right to remain silent. The right against self-incrimination. Etymologically speaking, Miranda is just a surname. It holds no Latin nor Greek references that usual legal terms have. So, how did this name come into the surface? Discover the case of Miranda vs. Arizona. This is a landmark case of the US Supreme Court that shaped the face of criminal justice not only in the country, but also to other places in the world. On March 13, 1963, Ernesto Miranda was arrested by the Phoenix Police department on the basis of circumstantial evidences that he kidnapped and raped an 18 year old girl. While under police custody, he was interrogated. During such, Miranda admitted the crime and signed a waiver that his admission was done out of free will. However, the issue that sparked the case was the absence of the information that Miranda was told of his right to counsel. 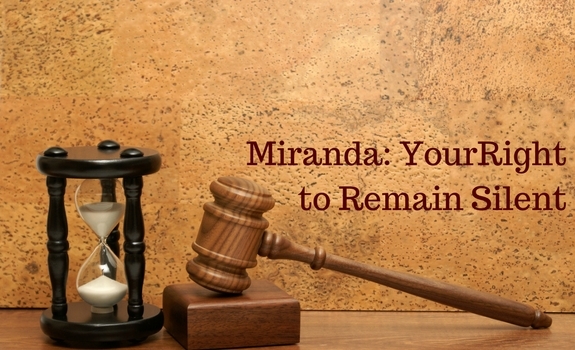 With a historic vote of 5–4 majority, the US Supreme Court acquitted Miranda of the charge. His statements were not admitted in court because the same were acquired in violation of the accused’s rights. Thus, the rights were named after Miranda. In line with the Fifth Amendment, any person accused of a criminal suit must be informed of his rights not to make incriminatory statements. He also has the right not to be tortured or pressured to admit a certain crime. Should you wish not to avail of your rights, you may waive it. However, waiver is not easily done. To make the same legal and binding, it should be done in writing and in presence of competent authorities. In some states, juveniles experience a special consideration. Their right to remain silent may be extended until their parent or legal guardian has arrived. The purpose of Miranda rights boils down to the presumption that every accused person is presumed innocent until the same is proven in the courts. Every person, no matter how criminal to the eyes of many, has the right to be heard and to present evidences on his behalf. VMcPO Law Firm, a Legal Service Provider in Chino California, boasts on our proficiency in the field of criminal law. Nevertheless, we are equally confident in our performance to the other aspects of law as well. Reach us via 844-433-1242 or info@vmcpolaw.com. With more than 25 years experience, Raymond primarily focuses on Bankruptcy, Family, Personal Injury, Real Estate, & Health Care - overpayment defense for health providers.